Okay, so I’m almost a week late with this recap. 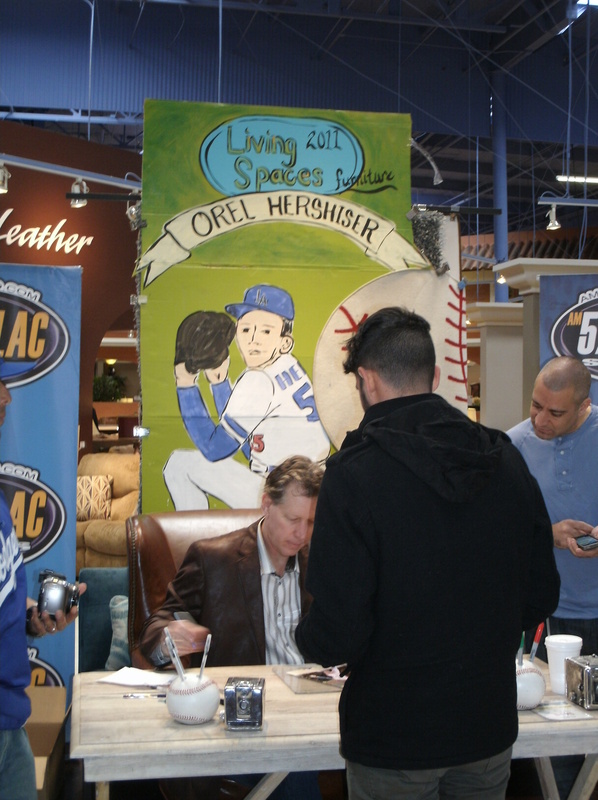 When I found out that Orel Hershiser was going to have a public appearance on Saturday, the 26th, I was torn between going to that or trying to get Opening Day tickets. Well, since there was no guarantee that I’d get tickets and I’d rather go to a free event than spend money you can guess from what the title is what I picked. I left my house around 6:30 am (I also had to go back home after a block when I realized I forgot my phone)… a little later than I usually would for a 10AM signing, especially one so far away. I hoped because of the cold weather, the rain, and the Opening Day tickets that maybe there would be a smaller crowd out. I plugged in the address in my GPS and nearly yelled at my GPS because it was so far away! I didn’t yell at the GPS again till I passed the 57 and it told me 17 more miles to my exit. It probably didn’t help that I was driving alone. If I had someone else with me, the drive probably wouldn’t have felt so long. And I wouldn’t have been responding verbally to my thoughts. Originally I had intended on going to Starbucks, but changed my mind and decided to head towards Living Spaces. Thankfully, I made the right decision to forego the coffee since when I arrived at Living Spaces it was very crowded! Someone who arrived after I did estimated over 200 people in line in front of me. I was about 20 or so in front of him. I figured that out because I can pick myself out in one of the photos he sent Roberto at Vin Scully is My Homeboy. Fortunately, it only sprinkled a little bit and very shortly the time I was there. 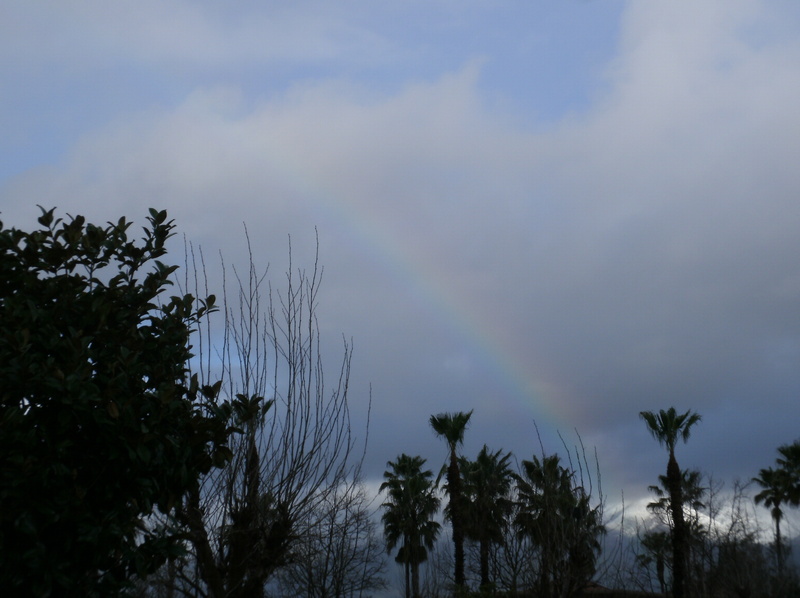 We were treated to a faint but still beautiful rainbow. They handed out wrist bands, starting with a shiny blue. After a while, they started moving the line inside the store. My friends and were one of the last groups to get inside the store. I have a bad habit of talking to people around me and never learning their names. The guy in front of me follows Roberto’s blog and said he had seen me at other signings before. And he saw the Matt Kemp video. My friend Simon was one of the first guys in line. He said he got there around 4 AM and was about fifth in line. 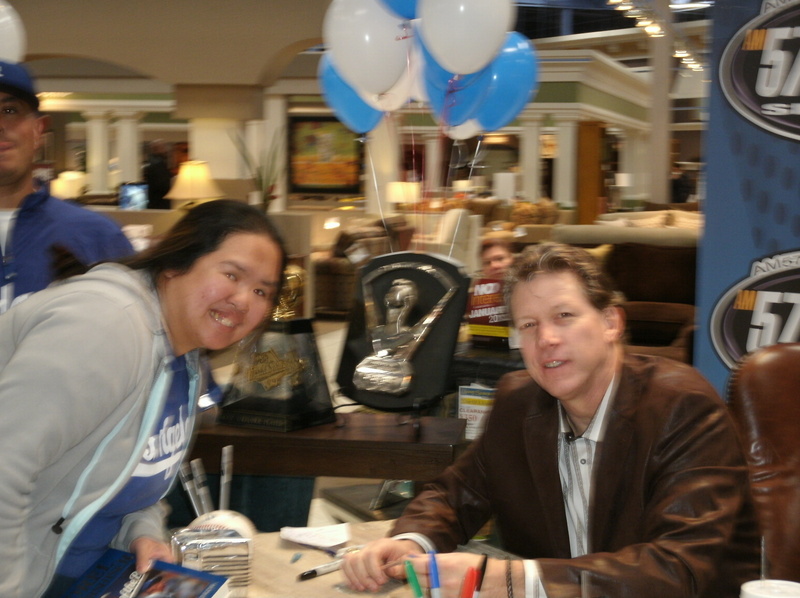 I didn’t have anything for Orel to sign besides a baseball card. Most of my autographs are articles in my scrapbook, but I couldn’t find anything in any of my four scrapbooks on Orel. So, all I wanted was a photo with him, since I have never met him before. I also brought a book he wrote to sign for my friend. Unfortunately, because there were so many people in line and I was so far in the middle of the group I was unable to get him to personalize it. Oh well. At least, I got my photo with him. They had a really nice set up for the signing. Vick the Brick was there. I couldn’t hear what he said at the beginning of the signing because we were too far back. 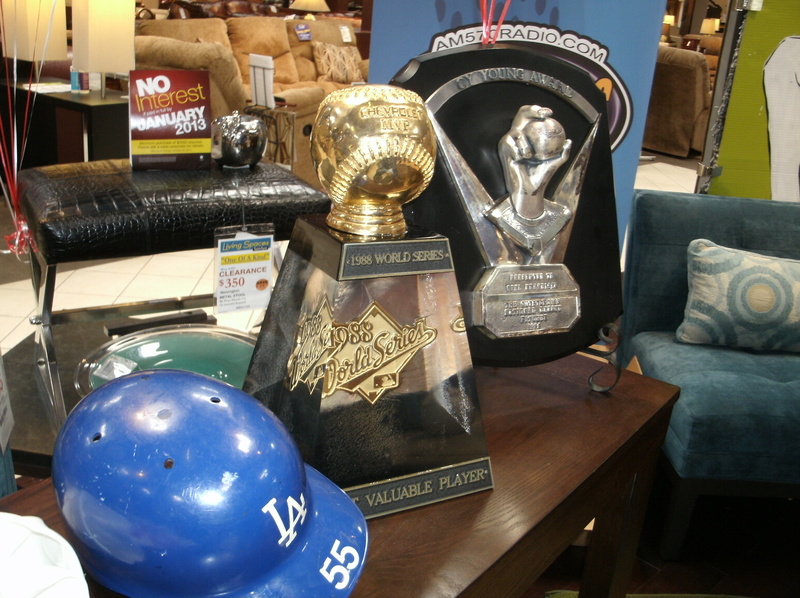 There was a table next to the autograph table with his trophies. They even had neat little baseball pen holders for pens and sharpies. 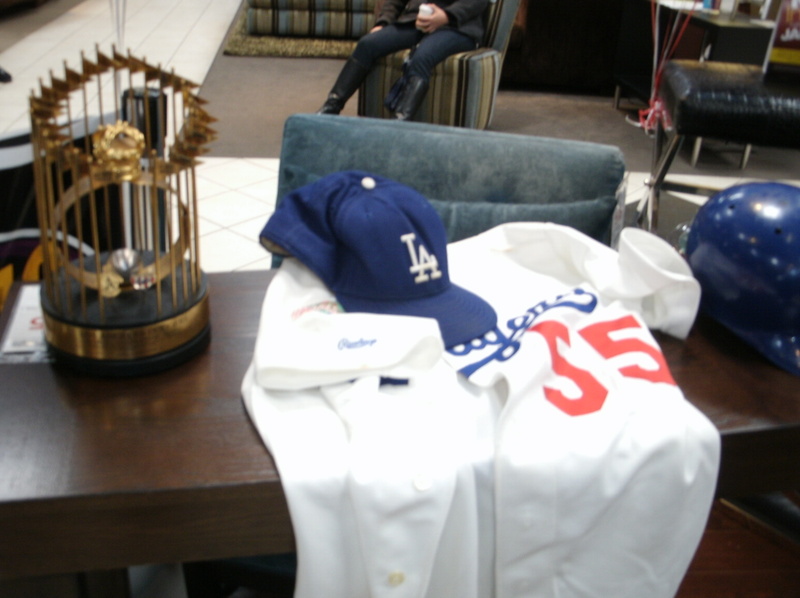 What really caught my attention was Orel would try out a pen or sharpie on a scratch paper before he would sign the item. I’ve never seen a player do that before. Way cool. They didn’t have the usual “Living Spaces” back drop behind the table. Instead, one of the employees drew a back drop. Hope you can make it out. Here’s an overview of what was on the table. 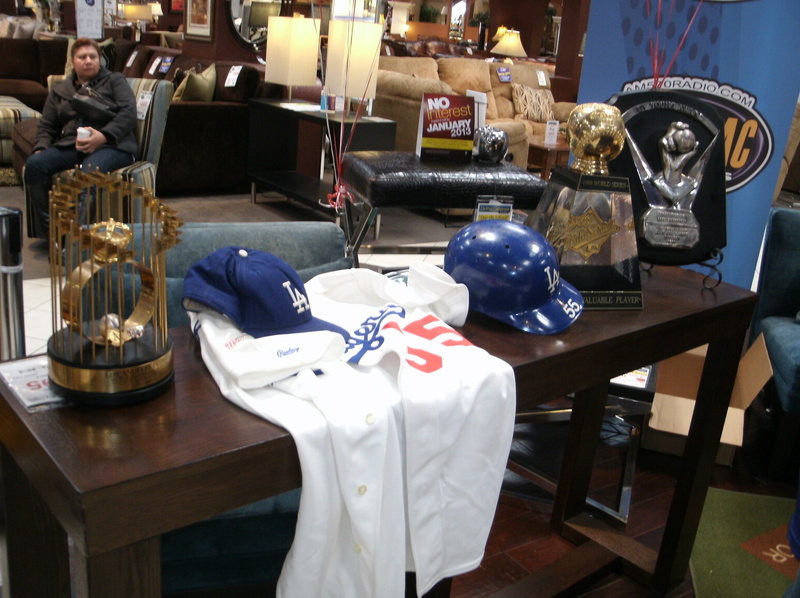 Here’s a closer look at some of the stuff on the table.